As part of efforts to maintain the professional appearance of the force, the Army dialed back the number, size and placement of tattoos in the March regulation. Previously authorized tattoos were “grandfathered” in, but Soldiers hoping to become an officer had to get an exception to the policy. The updated regulation takes into account that previously authorized tattoos should not prevent a Soldier from becoming an officer, but that candidates are to be evaluated based on the whole Soldier concept, or all characteristics of a Soldier. The rest of the regulation from March remains in place, including the restriction on sleeve tattoos and allowing no more than four tattoos below the elbows or knees. 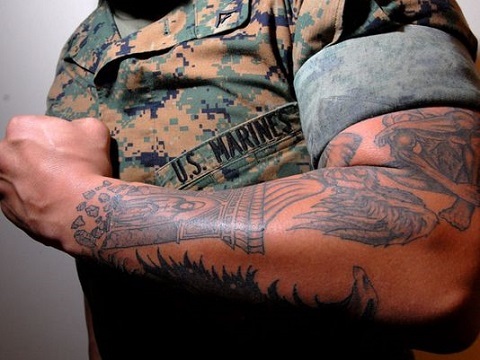 Tattoos below the knees or elbows must be smaller than the size of the Soldier’s palm with fingers extended. Permanent ink or branding on the face, neck, and hands, as well as tattoos that can be deemed extremist, indecent, sexist or racist in nature remain banned. Can I Join The Army With A Tattoo? 2. 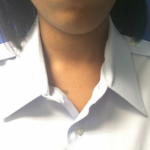 Army policy prohibits any tattoos or brands on the face, head or neck above the class-A shirt collar. Current policy for the hands only authorizes small innocuous tattoos or brands that are not prejudicial to the good order or discipline within Army units and do not detract from a professional military appearance. 3. Tattoos or brands that are extremist, indecent, sexist or racist are prohibited, regardless of location on the body, as they are prejudicial to good order and discipline within the Army. (a) Extremist tattoos or brands are those affiliated with, depicting or symbolizing extremist philosophies, organizations, or activities; those which advocate racial, gender or ethnic hatred or intolerance; advocate, create or engage in illegal discrimination based on race, color, gender, ethnicity, religion or national origin; or advocate violence or other unlawful means of depriving individual rights under the U.S. Constitution or federal and state law (see para 4-12, AR 600-20). (b) Indecent tattoos or brands are those that are grossly offensive to modesty, decency or propriety; shock the moral sense because of their vulgar, filthy or disgusting nature, or tendency to insight lustful thought; or tend reasonably to corrupt morals or incite libidinous thoughts. (c) Sexist tattoos or brands are those that advocate a philosophy that degrades or demeans a person based on gender, but that may not meet the same definition of “indecent”. (d) Racist tattoos or brands are those that advocate a philosophy that degrades or demeans a person based on race, ethnicity or national origin.